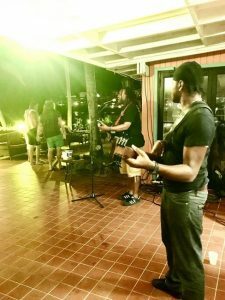 Iggie’s Oasis at Bolongo Bay Beach Resort in St. Thomas is the new home for the much loved Iggie’s Beach Bar and Grill, which was destroyed by the hurricanes in 2017. 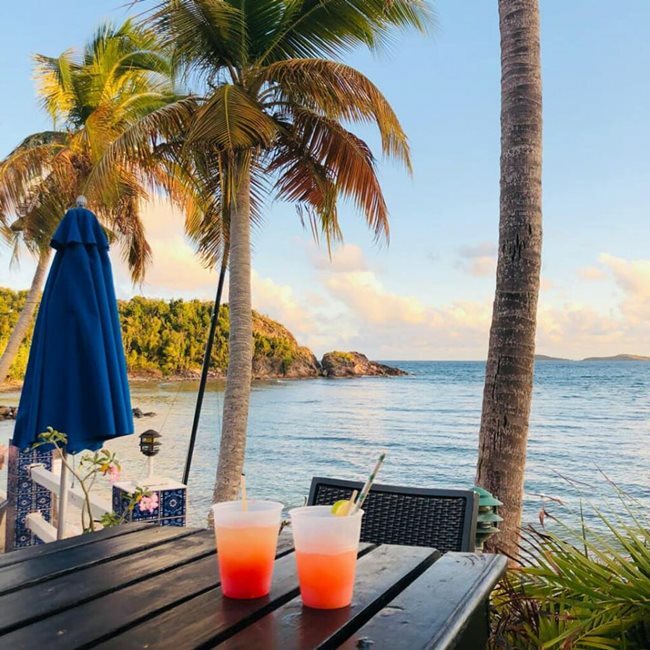 The original bar seemed to be right on the waterline, and Iggie’s Oasis is also on the beach, but a much safer several yards back, and above Bolongo Bay’s swimming pool. It’s a two-level restaurant that features a regular live music schedule, and a fantastic view of the ocean. From inside the open-air restaurant, you can see all the way out to some islands in the distance, and the ocean’s horizon. Iggie’s is more of a comfort food restaurant than an upscale experience. Water and frozen drinks were served in plain, plastic cups. However, the interior is attractive, natural stained wood walls and decks, with a white roof and wicker chairs, with ceiling fans above. The island music being played was a bit too loud and high energy for us, and a few shouting kids in the pool below dominated the dinner experience. The tables are cute, with maps of the Caribbean under glass. Along the beach you’ll see coconut trees, and you can watch pelicans dive right into the water to get their fish. At first, they’re just flying, and then they swoop down and smash into the water. Amazing! The menu is small, but restaurants still recovering from the hurricanes may still be building out their menus. You’ll find a wide variety of drinks, and appetizers including popcorn shrimp, chicken wings, and a fruit plate. 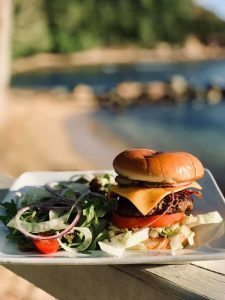 You can get a beet salad or quinoa and greens salad, and sandwiches including a Pulled Pork Sandwich, Tuna Burger, and Iggie’s Oasis Burger, which has shoe string onions and a signature sauce. 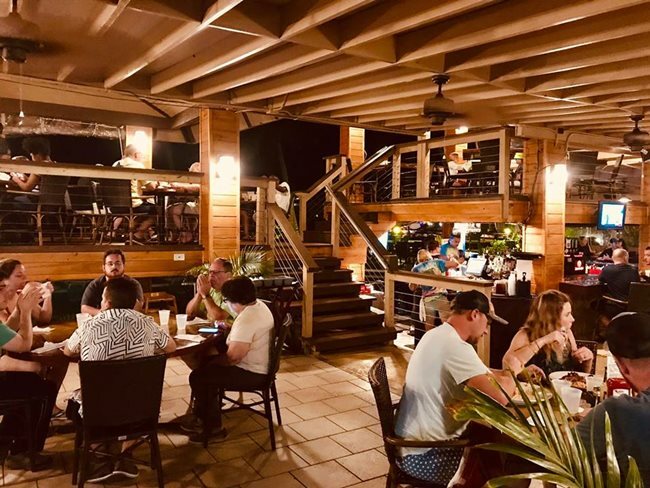 Entrees include the Grilled Mahi Creole, Grilled Ahi Tuna, and Broiled Lobster Tail. We tried a virgin daiquiri with strawberry and banana. Just how we like it, it was all ice, cool and smooth, instead of being too sweet and syrupy. Our appetizers came quickly, and we tried the Conch Fritters, which come with a spicy sauce and a lemon. They’re little balls of fried conch animal. It’s chewy, very meaty, interesting, and not too heavy. The breading and the frying were a substantive but not overwhelming part of the experience. We also sampled the fish tacos, fish served on lettuce in a soft taco shell and grilled, which were solid, but watery, and had a sauce that overran the fish taste. The three entrees we tried were all solid meals, not fancy but very pleasing. The Jerk Marinated Chicken, with pineapple salsa, and fried plantains, is juicy and not too dry. The chicken and potatoes could use more spice, but the sweet potato mash is sweet and uplifting. We also tried Iggie’s Famous BBQ Ribs, with plantains and fries. The fries were only lightly fried, so that you could taste the potato inside, and there’s was no need for a sauce for them. The plantains were similarly just lightly fried, so that they weren’t oily, and a little sweet. The mango sauce was so good and hot, and — wow! — the barbecue ribs just fell right off the bone. That made them so easy to chew, and they had such a deep meat feeling. You are getting your protein. Dipped in hot sauce, the ribs are a sensation, the most unusual twist and our favorite dish at Iggie’s. The 12oz New York Strip Steak was a high-quality meat, being easily chewed and not stringy or fatty at all. It was a thankfully large portion of steak, and came with tomatoes, scallions, and the same sweet potato mash that was good but also needed spice. We especially loved the juicy cherry tomatoes and the delicious gravy. For dessert, we tried the key lime pie, which was good. It has little shaved bits of rind that add a crunch, which some may like, although I prefer a smooth texture, and the graham cracker crust might have been more substantial to offset the pie filling. We also ordered the mango cheesecake, which was good but strange. It didn’t seem firm enough, and the mango was a subtle compote unable to compete with the cheesecake, which came with only a small amount of crust. The chocolate cake was our favorite dessert, more than half a dark, rich chocolate mousse. It was wonderfully powerful, almost stupefyingly chocolatey. 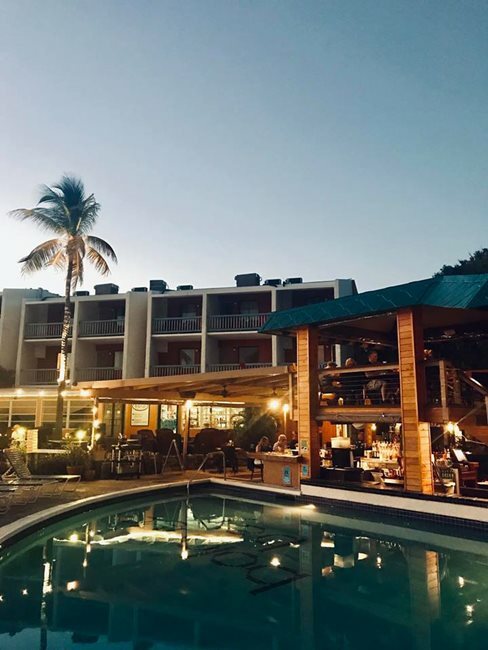 With its stunning views, and its hearty and unpretentious dishes, Iggie’s Oasis is a comforting place to relax and get recharged for your next day, with live music starting as early as 6pm. 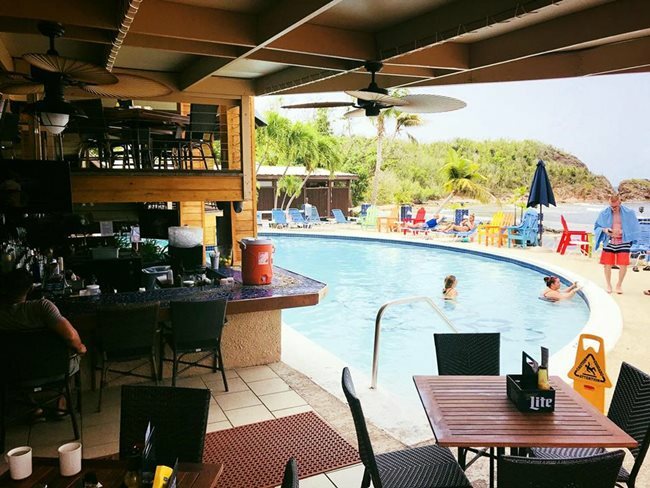 With the restaurant still in post-hurricane renovation, we very much look forward to the return of the full Iggie’s Beach Bar. For now, I’ll give Iggie’s Oasis at Bolongo Bay 4 stars. See the Iggie’s Oasis website, though they seem more current on Facebook. 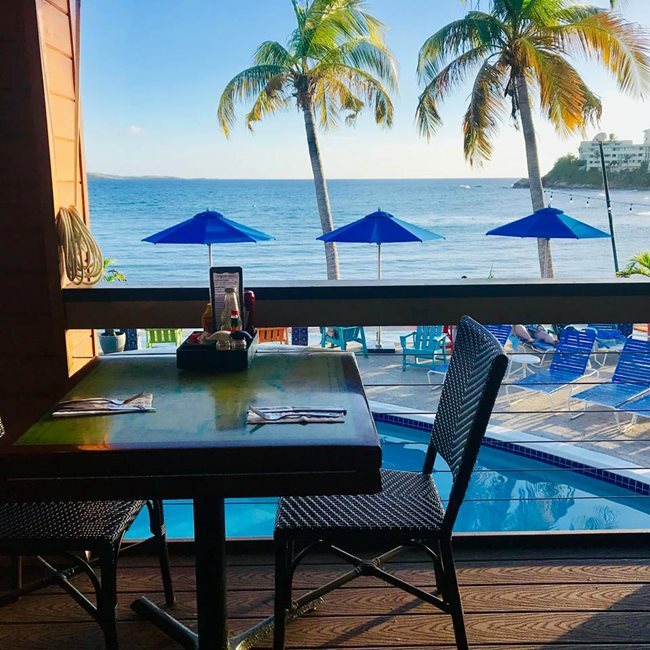 And read our review of Bolongo Bay Beach Resort (4.5 stars), the St. Thomas resort that is home to Iggie’s.